Rare photo courtesy of Timbaland. 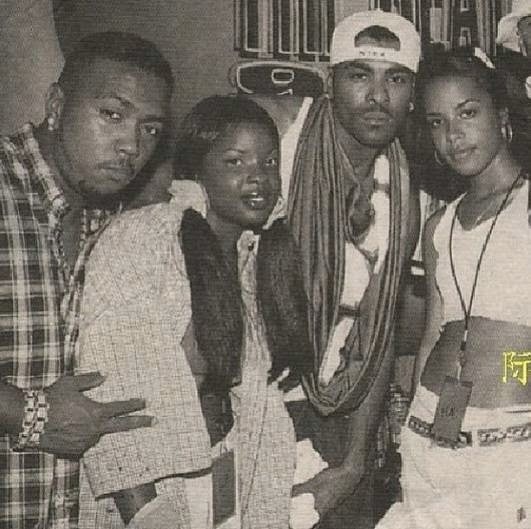 Throwback from 97/98 with Nicole Wray, Ginuwine and Aaliyah. Nicole Wray: Wow, Lady the band was a very organic project. I was in New York about three years ago. I was up here doing some music with Damon Dash and his little enterprise at the time. They had a lot of things going on. I went down here to work on a project and I met Terri Walker from London. She was working on some music and doing a film at the time. We just clicked like sisters. We started hanging out and eating together. We started doing shows together in the village and in the city. She was like “I want you to meet my guys” and I was like “Who are your guys?” She told me about Truth & Soul and I think we had a show and they saw us perform. From that moment on, they were like “We love you guys. How do you guys feel about being a girl group?” At the time, I was still focusing on my own solo project and Terri was doing her solo project. We were like “Let’s just see how this feels”. We went over to the studio and they played us a couple of tracks. We were just having some fun in Brooklyn. Before you know it, we had like eight songs done. Songs were getting done and everyone was getting so excited. Terri and I looked each other and we were like “We have something”. We put our own solo projects on hold for awhile just to see how this thing was going to go. We did a situation with Truth & Soul records and we put it out. We began to tour with Lee Fields. Shout out to him. We did an international tour and we opened up for him. Then we were shortly interrupted, Terri went back to doing her thing. Like I try to explain to people, we were both solo artists. Everybody knows I started out with Missy Elliott and Timbaland in 1998. I came in the game from Virginia and I was a baby. Terri was overseas doing her thing at the same time. We shared the same story because she was like “We know so many of the same people”. We never knew we were going to collide and meet each other and do an album together. Even though we’re not doing an album now, I’m still thankful and blessed to have met Terri and to have been able to put this project together and put these beautiful songs out. We both struggled with management, labels and family. We’re very passionate with our music and with this game, you’re here today and gone tomorrow. Not like death, but as far as your career. Us meeting each other, we had so much to share. We had a bond, it was super organic. She’s doing her own thing now and I stayed on with Lady. I love it and I couldn’t let it go. I just fell in love with it and I’m going to put my own project on hold and work on this. I do a lot of songwriting too, so I’m all over the place. I rap, sing soul music and I’m writing a children’s book. I just felt like once I got on the stage and I was able to open for Lee Fields, I was like “This is what I want to do”. YouKnowIGotSoul: This sound you have with Lady is a throwback sound and it’s totally different from the music people know you for. How did you transition from the Hip Hop sound into this soulful sound? Nicole Wray: Shout out to Missy Elliott. I have been singing loud and powerful since I was eight years old. When I got with Missy, she tamed my vocals because I was all over the place. I was raised in church, my family sang in church. It’s in my heart. I never really transitioned, it was always in me. Missy would be like “Nicole, this isn’t the song for screaming and yelling” because it was always there. I always had it. I was finding my voice and finding myself as an artist. I think once the whole situation with Missy and I, we separated and I found my voice. I began to sing what was already there in my heart and belted it out. I wasn’t writing in the beginning with Missy, I was a little protégé. I was young and I was like a baby. I basically just found my voice and my inner-self soul and when I met Truth & Soul, they had the soundtrack to my life. Everything that I had been through, coming into the game with my mom and then missing class to go on the road to tour with Aaliyah, Ginuwine and Timbaland. I loved what I did and I just found my voice and my soul. Truth & Soul brought the music so I could write and sing from my heart. YouKnowIGotSoul: You’ve had one successful album with Lady. Are you planning to work on another one with them? Nicole Wray: Yes, we are actually in the demo stages of the album. It’s sounding really good. We may travel outside the country to finish up the vocals and stuff. It’s working its ways. It’s coming along and it’s sounding really good. It’s more colorful this time. The first album with Terri and I was really from the heart. We didn’t think about it. It was just organic. We didn’t have the time to think about what we were going to write. The guys were in the room and we were drinking whisky. We were having a good time and lyrics were just flowing. This album is more personal and more fun. We’ll still have those love stories, but we’ll talk about the struggles. I want to reach out and be relatable to people who live everyday life. YouKnowIGotSoul: Are we going to hear another solo Nicole Wray album in the future and what would be the sound of the project? Nicole Wray: It’s going to be R&B. I’m going to give the fans what they want. I let them guide me because without them, there wouldn’t be any me. I wouldn’t even exist as an artist. There wouldn’t be Lady or Nicole Wray. I listen to my fans and I thank God for social networking. When I first came out with Missy Elliott, there wasn’t really that much social networking. It was just word of mouth. If the label liked you, they would sign you and you would go do your thing and go on tour. Now there’s so much going on like Twitter and Instagram, it’s so easy for artists. Then you get those reality shows that you can get on and be vocal and show your talent. When I started, I was super young. I was like fifteen when I met Missy Elliott. She was like “I got you” and my mom was like “Make sure you take care of my daughter”. The game has changed a whole lot, but I will definitely listen to my fans. It’s in me. I can do any type of music. YouKnowIGotSoul: Talk about some of the memories you had with Static Major and Aaliyah because I know you were close with both of them. Nicole Wray: I remember my mom living in this apartment in Virginia and Missy came over because her mom lived in the same neighborhood. She came over and got on the phone. She called some guys from Derby City. She was like “I got this little girl sitting here and she’s amazing. I’m going to let her sing to you on the phone”. I sang “Weak” by SWV to Static on the phone and he was like “Say no more. I’m coming to Virginia and we’re going to work on your album”. I wasn’t writing, I was young. He came in the studio and he had so much swag. He had that swag. All of Playa did. Black, Smokey and Static had “Cheers 2 U” and they were working on their album too. We were working in Virginia Beach in the studio and Missy was just sitting in the studio with him. My mom was in the studio too, she was managing me at the time. I had a boyfriend at the time and we were so in love and I was so young and stupid. *Laughs* We had an argument and I was irritated in the studio. Static was like “Don’t worry about it. Just tell him to raise his frown”. He started singing “Raise Your Frown” and I was like “Oh my god!”. It’s like he watched me as a young girl and like I do now with artists because I write now too thanks to Static. Like he opened up that portal for me because I didn’t know I could do it. I was just singing songs that everybody wrote for me not knowing I had my own story. He was basically watching my life and he wrote those songs that were beautiful. It’s like he studied me, it was awesome. YouKnowIGotSoul: You mentioned earlier to me that you toured with Aaliyah? Nicole Wray: We had a “Superfriends” tour in 1998 or 1999. We did a big tour. We went everywhere. I think we started out in LA. When I first met Aaliyah, we were shooting my video for “Make It Hot”. Everybody was there. I was so nervous, this was my first video. They pulled me out of school to go shoot a video. All I would see is TV and seeing Toni Braxton, Mariah Carey, Mary J. Blige and The Fugees. Finally it was my time. I was so nervous. Where I come from, we’re not nervous people. For some reason, the lights and the camera were on me and I had a wardrobe. They were making clothes and my mom was there. Missy Elliott was like “Aaliyah is here! Go say something to her”. Aaliyah was like “You’re my sister, I’m here to support you. I love your music and I love your style”. From there, I would always see her and we would talk to each other. We had a cute friendship, but it was short-lived. God bless her soul, she was super talented. I’m just thankful that all of those guys came to my video shoot because they were already established. I was just coming into the game. We were probably the same age but she was already more established. I was thankful she came to my video shoot and showed me so much love. YouKnowIGotSoul: Since the “Make It Hot” album, you’ve had a lot of material that you worked on over the years and I know a lot of them never saw the light of day. Is there a song that you can think of that you would have loved the fans to hear? Nicole Wray: My favorite show right now is Netflix is “Orange Is The New Black”. The new theme song is called “Time” or something like that. When I was on Roc-A-Fella, I made a song called “Time” because I knew a lot of people in and out of jail. The way I did it, it was beautiful. It was raunchy, but it was really personal and it was dedicated to the mothers and fathers who are waiting. Then the show comes out years and years later and I was like “I already recorded a song like that!” It never saw the light of day. Once we finish this album, I want to put out a mixtape like what Nas did with “The Lost Tapes”. I have so much music. I started writing after the “Make It Hot” album and I have so much music. I worked with Pharrell, Teddy Riley, Timbaland and Scott Storch when he was on his game. The list is crazy. I have those songs just sitting in my laptop.